Designers of lithium-ion (Li-ion) battery-powered mobile and portable devices such as wearables, electric bicycles, power tools and internet of things (IoT) products can improve the end-user experience by extending run-time and delivering the most accurate battery state-of-charge (SOC) data in the industry with the MAX17262 single-cell and MAX17263 single-/multi-cell fuel-gauge ICs from Maxim Integrated Products, Inc. The MAX17262 features just 5.2µA quiescent current, the lowest level in its class, along with integrated current sensing. The MAX17263 features just 8.2µA quiescent current and drives 3-to-12 LEDs to indicate battery or system status, useful in rugged applications that do not feature a display. Designers of electronic products powered by small Li-ion batteries struggle to extend device run-times to meet user expectations. Factors such as cycling, aging and temperature can degrade Li-ion battery performance over time. Inaccurate SOC data from an unreliable fuel gauge forces the designer to increase the battery size or compromise the run-time by prematurely shutting the system down, even if there is usable energy available. Such inaccuracies can contribute to a poor user experience due to abrupt shutdown or an increase in device charging frequency. Designers also strive to get their products to market quickly due to competitive demands. 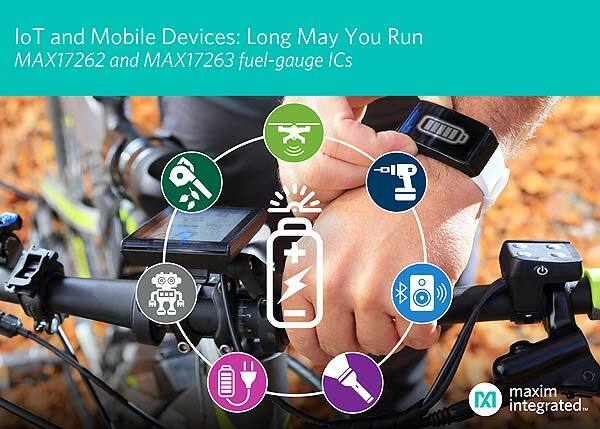 Maxim’s two new fuel-gauge ICs help designers meet end-user performance expectations and time-to-market challenges. The MAX17262 and MAX17263 combine traditional coulomb counting with the novel ModelGauge™ m5 EZ algorithm for high-accuracy battery SOC without requiring battery characterization. With their low quiescent current, both fuel-gauge ICs minimize current consumption during long periods of device standby time, extending battery life in the process. Both also have a dynamic power feature that enables the highest possible system performance without draining the battery. In the MAX17262, an integrated RSENSE current resistor eliminates the need to use a larger discrete part, simplifying and reducing the board design. In the MAX17263, the integrated, pushbutton LED controller further minimizes battery drain and alleviates the microcontroller from having to manage this function.